The Torrance Hotel, East Kilbride. I have to tell you about my go to hotel in Scotland, more specifically East Kilbride. 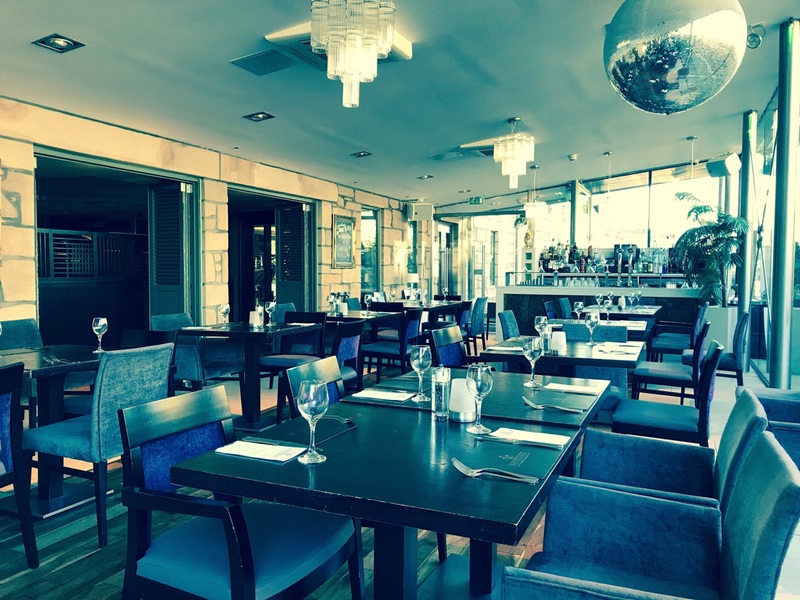 I would like to introduce to you The Torrance Hotel, Bar & Restaurant part of the Manorview hotels & leisure group. This hotel can be found in the Village, East Kilbride. A quiet village I must add, but that’s what makes it so suitable for me and those who want a nice get away for some relaxation, or even a lovely meal. Due to work commitments myself and my colleagues stay in Scotland pretty much every week, we have stayed in a number of hotels in Scotland but The Torrance is our preference every single time. Why? Here is why… The staff are so friendly that actually after a while I feel part of the family, my colleagues say exactly the same. 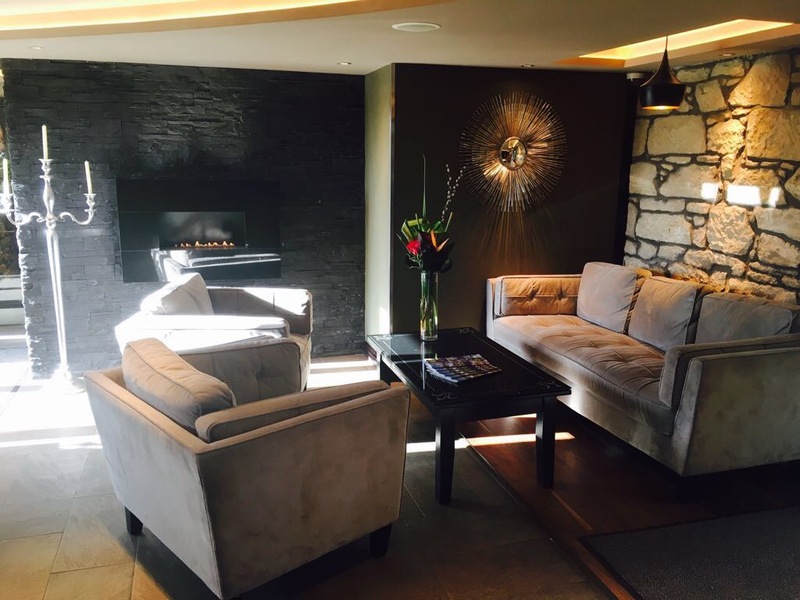 On arrival you are greeted with a warm cosy fireplace in reception, fresh flowers in vases and the staff are smartly dressed in the Manorview corporate colour purple and there is never too much they can do for you. They genuinely want you to have a pleasant visit. If you decide to stay at the hotel the check-in process takes no time at all which is great considering all you ever want to do is get to your room. I certainly do. Once you have your room card, you are on your way to some “you” time. The hotel has a lift, not just any old lift, a clear glass one, my colleague once said to me to take a photo of this lift because of its transparency, which he said reminded him of the lift in the Willy Wonka movie the part where Charlie, Willy Wonka and his grandad fly over the houses, he entertained myself and another one of my dear colleague for a while with this story as the glass lift allows you to see the outside world whilst heading up to the 2nd floor. If you have as much luggage as I do I recommend using the lift. First place we all look when in hotels are the beds and bathrooms you no need to worry here. Everything is clean and fresh with white linen, definitely ideal for you to relax whilst having a bath/shower or watch TV on your bed. The rooms are spacious, clean with modern decor and each room offers all that you need during your stay. My favourite thing about each visit to the hotel is the Tunnocks tea cakes and caramel bars you get by your tea and coffee facility in your room. This I find if I’m late for breakfast I always tend to eat, I am never on time for anything so sometimes have to skip it. (I wouldn’t recommend eating chocolate for breakfast but actually go to the breakfast room and have a proper breakfast, it is delicious, if only I could manage to get out of bed most mornings. You have a mini bar, iron and ironing board which is great, I can’t bare requesting for an iron and board at other hotels its rather annoying when you have to wait to iron your clothes especially with my poor time keeping, a safe, hairdryer, shampoo & conditioner, hand wash, and other bathroom treats. You also have large TV’s in your room with the facility to watch Netflix great for those lengthy visits for my colleagues and I. The bathroom is also another favourite of mine. As you can appreciate not all the rooms are the same size but if you are lucky enough to get a room with a jacuzzi bath well then, head down to the co-operative down the road (5 minute walk) get some bath oils and relax. 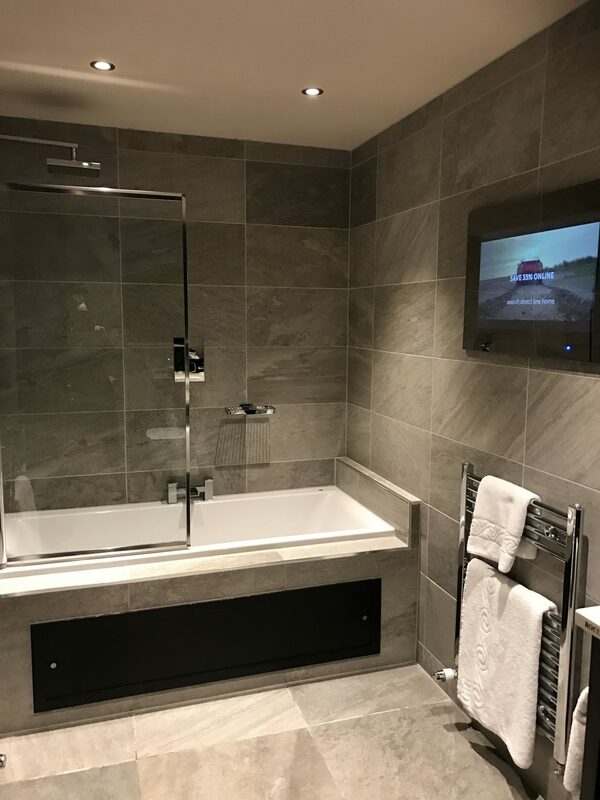 You may also be lucky enough to get a TV in your bathroom although I just have the music channel on as often I am getting ready for my Torrance evening meal. The bar has a great vibe, its very cosy, in fact no view is the same wherever you sit, one side of the bar has a cute fire place with comfortable sofa’s, TV’s screens if you like to view sports and even small televisions in the booths by the bar. Its a fantastic atmosphere and again the staff are incredibly accommodating. If it tickles your fancy why not try a cocktail or two. They have regular specials on food and drink. I would suggest reserving your dinner table as sometimes it can be busy, especially now we are heading towards the summer months and everyone is coming out of hibernation. The restaurant tables are spread out so you are not sharing conversations with people sat beside you like in other restaurants, you can have a booth in the restaurant, table or sit in the bar and eat from the bar menu. We do a mixture of both to be honest. Both bar and restaurant have great menu choices and is good value for money. I tend to go for a three course meal quite often although I have cut down to two courses I am sad to say as I am on yet another diet. Even if you are dieting like me they offer low fat alternatives don’t you worry. Once seated the staff will pour your drinks, take your order and look after you the entire time. They are always making sure everything is to your liking, even after all this time they could just ignore me and think she is here all the time she doesn’t matter, but no, they do look after me and everyone who visits, its all part of the excellent customer service they all provide. Also, if you wanted to you can even sit in the conservatory to eat your dinner. Most of all when I have dinner at the Torrance, I have to have a dessert. 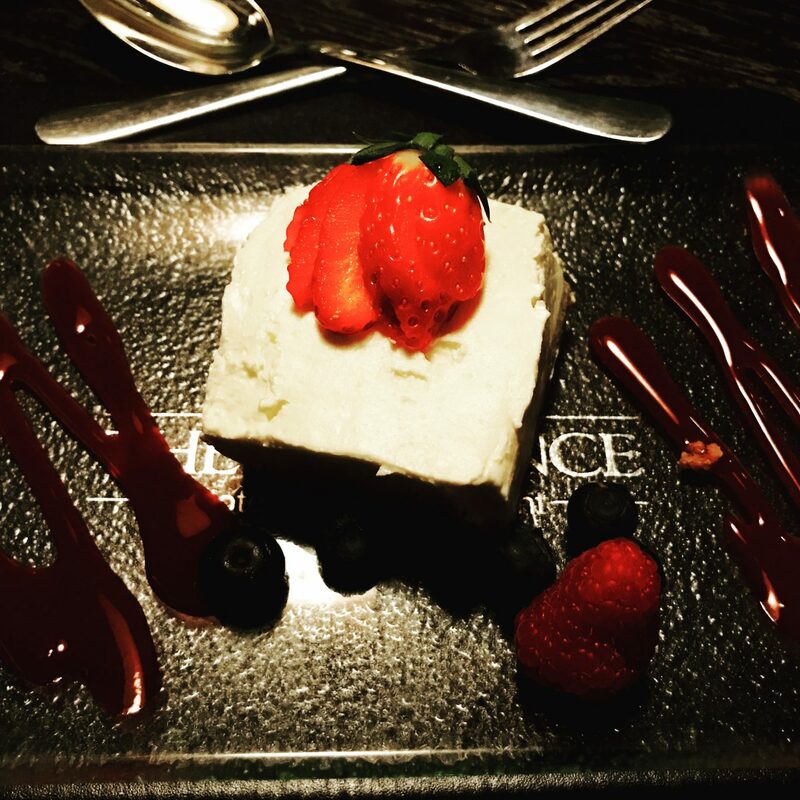 So if I am cutting down to two courses I still get my dessert. Delicious. The Torrance has so much to offer, they hold parties and weddings, (You should see the honeymoon suite, amazing). 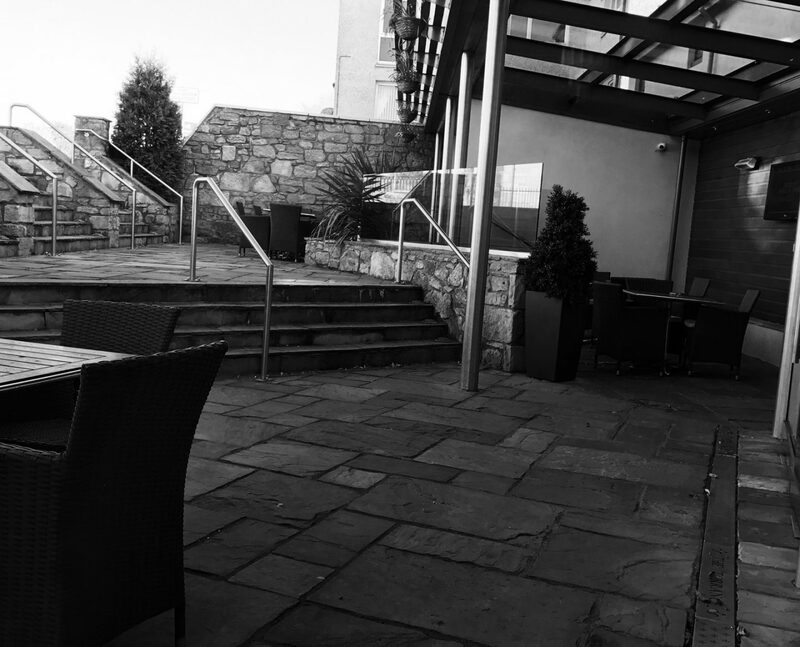 The Torrance has great outdoor seating areas all around the hotel and with heaters for those colder evenings which more often than not can be a bit chilly in Scotland especially for those that travel up from the south, its like being in the arctic. That’s not an exaggeration. Well, maybe. I must admit, coming from the south (Kent) travelling to what feels like the end of the earth sometimes, I feel safe here, I feel like its a home from home in this hotel and mostly that is all down to the staff making my colleagues and I feel welcome on every visit. I would highly recommend booking this hotel when you next visit East Kilbride you will be looked after and you will be pleasantly surprised by this fabulous hotel. My colleagues and I discuss regularly where we have booked ourselves in and if we are lucky enough to get a room at the Torrance we do brag about it a bit. I do anyway. “So where are you staying next week?” I smugly ask my colleagues “We didn’t manage to get in the hotel they were fully booked” with a smile “That’s a shame, I’m in my favourite hotel and my favourite room” Better luck next time colleagues. Book early is my advise. I would like to take the time to thank all staff both at The Torrance and The Busby for looking after my colleagues and I so well. Looking forward to seeing you all again soon. With love and thanks to my colleagues and Owain and Oscar for their photography skills, the two gents that make my stay even more pleasurable listening to lads banter and boys talk. It sounds like a great hotel, and complete with all the amenities! And having pleasant staff around like what you describe almost guarantees an awesome stay. Thanks for sharing!